Math Teaching Tip #6: Why Learn a New Method? The fact that so many middle and high school math students are doing so poorly is a source of great pressure and frustration for everyone involved. Employers—who need well-educated employees to be competitive in a global economy—blame schools, administrators, and teachers for not getting better results. Teachers—who work very long hours in situations of intense pressure—often blame uncooperative, unmotivated, careless, lazy students, and their parents, and society at large for preventing them from doing a better job. And many low-achieving students—forced to deal daily with things that they truly don’t understand—are understandably frustrated, too. Who cannot sympathize with the complaints of any of these aggrieved parties? But after all the blame is spread around, not much changes. The number of under-performing math students is still staggeringly high. Many students struggle sincerely with their classwork and homework and tests, and often they can master no more than 60% of the material presented. That actually represents a significant amount of learning; but for all their trouble, those students are rewarded with nothing but an “F.” Frustrated teachers and students—who have had more than enough angry scolding from concerned citizens—may justifiably feel that, since they are already doing their honest best and working as hard as they can, it just doesn’t get any better than this. They realize that their best is just not good enough, but are convinced that that’s just the way it is. However, slumbering at the back of everyone’s mind is the vague, hopeful feeling that there is, there must be, a better way of enabling more students to succeed—if only they knew what it was. The fact that something needs doing implies that there must be a way of getting it done. And that is true. But the achievement of different results requires the use of different methods. Current math teaching methods and materials are actually quite effective, but only with a limited number of learners—students whose minds work in much the same ways as their teachers’. Many of today’s math teachers and textbook authors went to school at a time when only an elite group of pupils was expected to study college prep math. But today, all students—regardless of their personal background (socio-economic level, home language, parents’ level of education, previous mastery of prerequisite math concepts and skills, etc. )—are expected to master algebra. The problem is that today’s pupils are being taught mainly with methods and materials that were designed for use with the elite students of an earlier period, whose personal background and level of preparation was markedly different. For more universal access to success, pupils and instructors need a truly different model for teaching and learning—a method that takes into account the mindset of the great mass of students whose minds, for the most part, do not work in the same ways as their teachers’. That is the aim of the new books based on the guided discovery method: to provide a new model for teaching and learning about math. Fortunately, the new model is simple and pleasant, for neither teachers nor students have time or energy to take on a complicated new methodology. Some of the main features of this new approach are: exploration of physical models as a starting point for taking on new abstract ideas; engaging students’ power to notice relationships when working with concrete, numerical examples; using students’ amount sense to inform their sense of procedure; replacing book/teacher-centered explanations with pupil-centered development of reasoning; providing frequent links to underlying concepts and skills; and developing fluency in a context-derived way. Many (but not all) college prep students in years gone by were capable of memorizing and successfully applying rules, short-cuts and formulas for concepts that they truly did not understand. Students and teachers alike tolerated the ambivalence of plunging ahead without real comprehension, confidently assuming that understanding would come along in its own sweet time, made possible by the enriched perspectives supposedly provided by successful practice (“Don’t worry, you’ll understand it later”). Sometimes that understanding came, sometimes it didn’t. Some students never did understand what they were doing, but got good grades anyway; they relied on the expediency of rote mimicry to eke out reasonable academic success. The goal they achieved was getting good grades; they did not achieve the goal of increased comprehension. This approach simply does not work with many math under-achievers. For them, real sustainable progress only flows from real understanding. And the development of real understanding generally requires a slower pace, giving proper time to the thinking of deep new thoughts. This may seem grossly inefficient to many teachers, considering the tremendous pressure they are under to produce quick results. But this worry is misplaced. Just as we must spend money at a good sale in order to save money in the long run, so we must spend time to save time. Students who work their way carefully through guided discovery lessons progressively display increased confidence, accuracy, and speed. And each new concept, solidly understood, provides a sure basis for taking on the next new concept. The students also begin to feel a greater connection between their formal math education and their natural sense of curiosity. Books based on guided discovery are purposely written in a simple style so that students can just read the directions and follow them—and then what should happen in their minds will happen. However, there are always students who have trouble reading or following directions. When teachers or parents are called upon to assist these students, they will get the best results not by telling them what to do and explaining why and how to do it (that approach has already proven not to work with many low-achievers)—but by asking the students leading questions, guiding them to figure things out for themselves. One of the main reasons that students are required to study high school algebra, after all, is for them to learn to think and reason more effectively. Guided discovery, when properly practiced, makes this achievement possible. A few years ago I tried out a new kind of informal assessment. I had noticed that some of the high school algebra students were confused by expressions like “5a + 3(a + 7).” I wanted to find out what they really understood about the distributive property and the gathering of like terms. So I took a pencil and a clipboard with two pieces of paper on it, and wrote “8a” on the top piece of paper. Next, I lifted up the top paper and drew a vertical line down the middle of the second page—and then let the top page fall back into place. As the students meandered in before class, I went up to one of them and said quietly, “I’m taking a little survey; mind if I ask you a question?” Then I pointed to the “8a” on my clipboard and asked, “What does this mean to you?” The kid said, “I don’t know.” “OK, thank you,” I said politely, and turned away from the student. I jotted down the kid’s name to the left side of the vertical line on the second page; that was where I wrote the names of students who I would gather later in a small group for remedial work. I turned to another pupil, who said, “It means eight times some number.” I thanked him and wrote his name on the right side of my recording page. The next student said, “It means you’ve got eight a’s.” “And what does that mean—that you’ve got eight a’s?” I asked. “I don’t really know,” she said. I wrote her name on the left side. The passing period between classes is short, but it was enough time to identify a small group of students that needed remediation. Looking back at this experiment, I think there were certain aspects that made it successful. First, my survey focused on a key underlying concept that was essential for success in the students’ current math work. Second, I selected students that I suspected might not know the answers to my survey question (students who usually scored low on homework and tests, or who rarely spoke up in class). Third, I approached the students in a relaxed, informal manner before class, when the ambient noise and movement would provide the mini-interviews with a pressure-removing cover of privacy. Fourth, I wanted them to feel and know that I was sincerely interested in knowing what they thought; and I wanted them to feel at ease, so they would be inclined to honestly tell me what was on their minds. So I purposely used a conversational tone of voice, rather than an authoritative teacher voice—which could have communicated a feeling of “I’m going to ask you something that you really ought to know, so pay attention, concentrate, and answer correctly!” Fifth, to keep the students feeling at ease and to protect the authenticity of future similar encounters, I didn’t tell them if they were right or wrong; I purposely suspended judgment in favor of just getting honest input. This worked so well with the first class, I decided to try it again with several students from the next class. As before, there were a few students who did not understand the meaning of the “8a” notation. Then it occurred to me to probe a little farther, so I also wrote “5a + 3a” on my clipboard, and asked the students what that meant. Every single student told me that would equal 8a. And when asked again what 8a meant, they still didn’t know. Now that was interesting—they were fluent with the process of gathering like terms, but did not understand what the terms meant! I tried this same informal assessment technique another time when I wanted to find out who needed help with squares and square roots. When undertaking the Pythagorean Theorem or quadratic equations, it’s essential for students to know what a2 or x2 stands for—and that they know squares at least up to 152. So this time I wrote 52 on the top page of my clipboard, and asked selected students what it meant to them. Some said “twenty-five,” others said “ten,” others waffled between those two answers, one thought it might be “seven,” some were certain, some were not sure, and some had no idea. To probe further, I also wrote 112 and 142 and √100 and √169 and √225 on the clipboard. I found that some students who knew 52 did not know the larger squares; some knew about the squared numbers, but knew nothing about square roots. I also noticed that some students overheard what other surveyed students near them had said, so I added 72 and 82 to my list of questions to prevent them from merely mimicking their classmates. Once again, this survey process produced an accurate selection of students for small-group remediation later in the class period. When helping out another teacher with his class, I asked if I could do a similar informal survey with his students. I had recently helped one of his students with some other math work, and discovered that she knew nothing at all about squares and roots. I was hoping to help her and some other students with that on this day, and wanted to gently and accurately identify students who would benefit from a small group remedial lesson. The teacher didn’t like the survey idea, and instead wrote a dozen simple expressions containing squares and roots on the board, explained that he wanted to find out who needed help on this sort of thing, passed out paper, and asked students to write their answers. This approach seemed to be simple and direct, but it had less than the desired effect. Students were immediately troubled: “Why were they being tested on this?! No one said anything about there being a test today! Everyone knew that stuff! Who on earth would need help with that?! Did he think they were stupid?! What a waste of time! Etc.” Finally the class quieted down and wrote their answers. Then they exchanged and corrected papers. Guess who got all the answers right but one? Yes, the girl who didn’t know any of it. She was very proud, very protective of her ignorance—and an absolutely consummate cheater. No way was anyone going to find out that she didn’t know that stuff; she made sure that one way or another she got those answers. I wished that we could have just taken the informal survey approach; even though it was less comprehensive than a written quiz, it was more gentle, more accurate, and less time-consuming. Judging from the number of low-achieving math students in almost every school, it’s clear that even an excellent teacher can give a splendid lecture to an interested, involved class—and the students’ subsequent class work, homework, and tests can nevertheless be riddled with conceptual and factual mistakes. “I taught it, but they didn’t learn it” is an oft-repeated teacher lament. Trying to teach students lessons that they are not prepared to learn is an exercise in futility. To be successful, lessons must address the minds of the students exactly where they are—not where they are supposed to be. For that to happen, teachers must be aware of what their students really know. In an effort to put their finger on the pulse of their pupils’ minds, teachers usually utter two obligatory words at the end of every lecture: “Any questions?” But all too often, students do not ask questions when given the opportunity to do so. So the teachers are left to wonder: Who doesn’t know what? Problem of the Week #14: What is the Circumference? 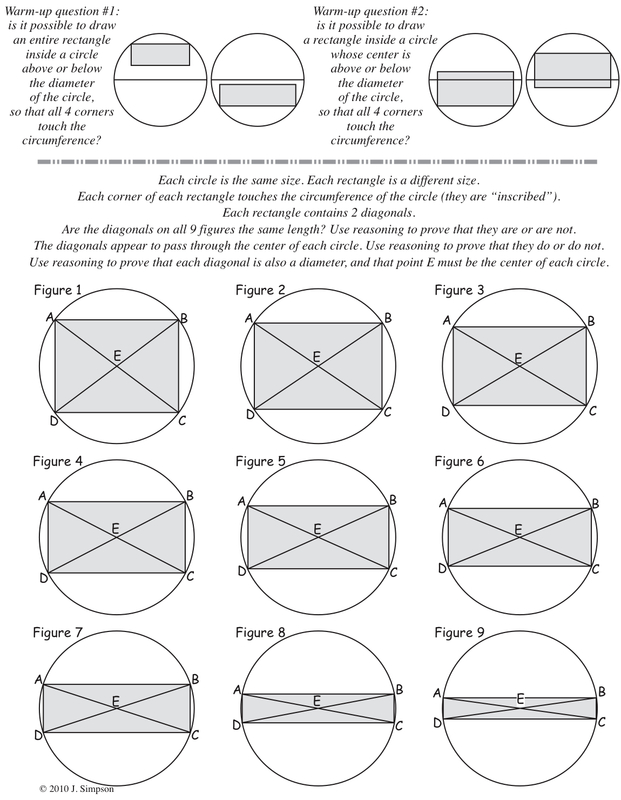 Building on the last two problems, what do students need to notice in the diagram, what shapes, properties, and relationships do they need to consider to solve this problem? Then solve it. The area of rectangle ABCD is 588 cm². The left side is 21 cm. What is the circumference of the circle? Use Π = 22/7. 5. 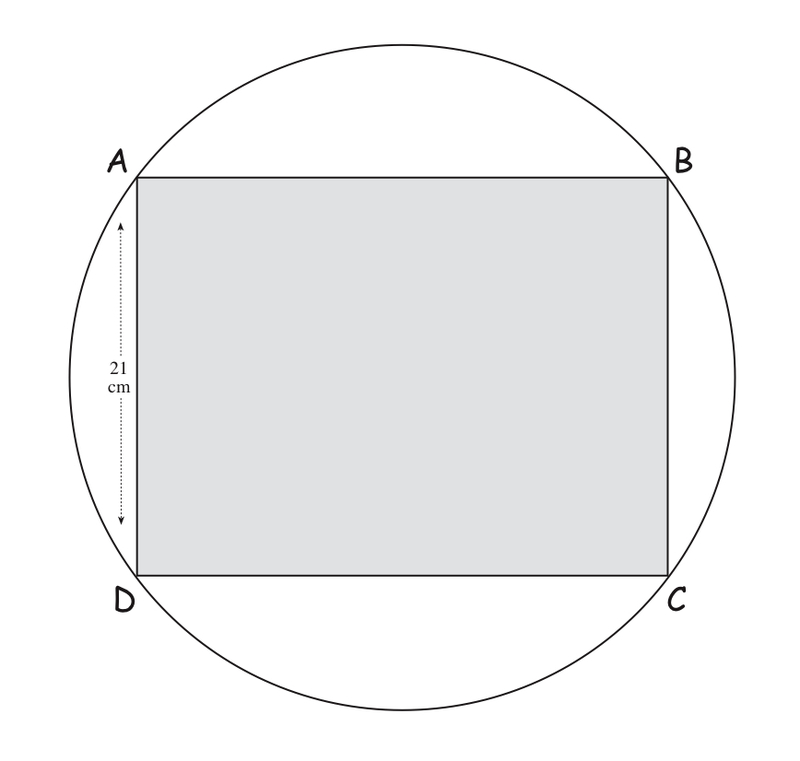 Draw a diameter from left to right through the middle of the circle, parallel with the bottom of the square. Is the measurement of the diameter the same as the width of the square? 7. If the width of the square is the same, what is the perimeter of the square? Which is longer, the perimeter of the square, or the circumference of the circle? 9. If the width of the square is the same, what is the perimeter of the square? Which is longer, the perimeter of the square, or the circumference of the circle?